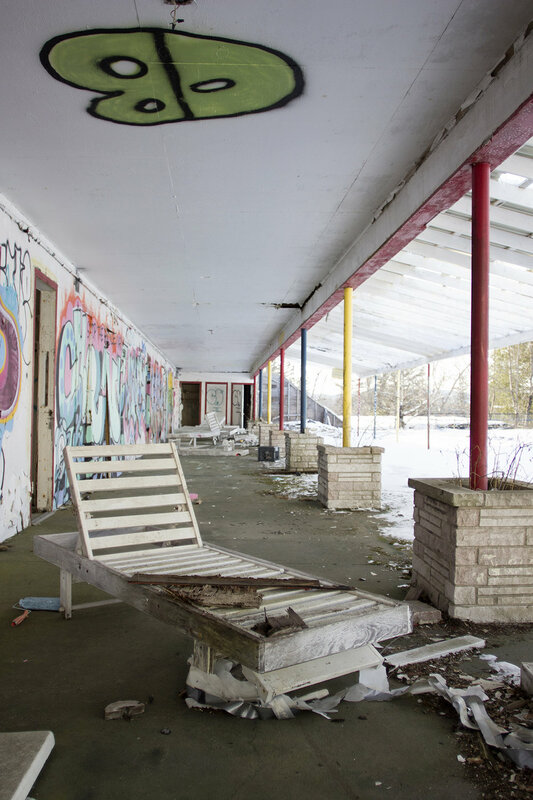 If you're interested in abandoned places, chances are you've seen photos of the abandoned Borscht Belt resorts in the Poconos and the Catskills. 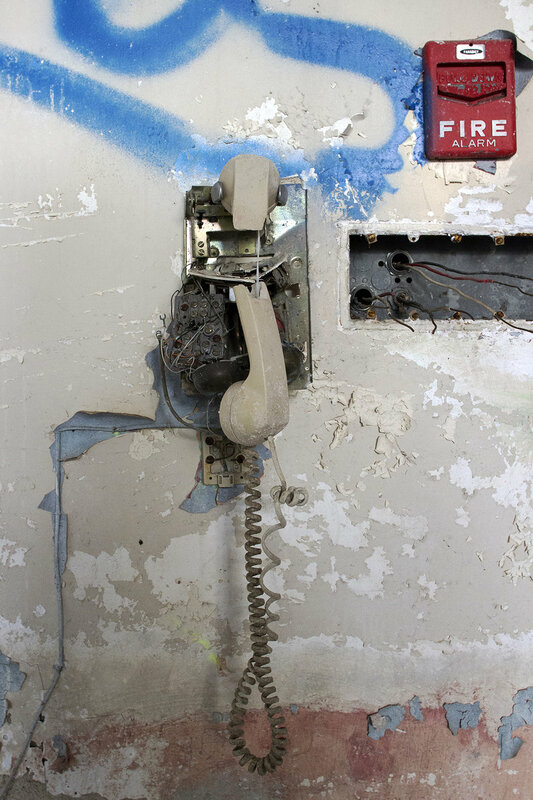 David and I had the use of a car recently (not a Zipcar, which has mileage restrictions) and his first suggestion was that we go explore some of the abandoned resorts that I hadn't been able to stop thinking about since I first saw photos of them years ago. Our first stop was the Summit Resort in the Poconos, but the area was very crowded and appears to be slated for redevelopment. I didn't feel comfortable creeping on a place where people had been known to get arrested, so we moved onto my backup plan, The Buck Hill Inn ... only to find that it has been completely demolished. It was getting late but I still had hopes that we could salvage our day by visiting my third choice, The Pines Resort. The Pines Resort, located in South Fallsburg, NY, opened in 1933. It's about an hour and a half drive from New York City, in the Catskills region of Upstate New York. 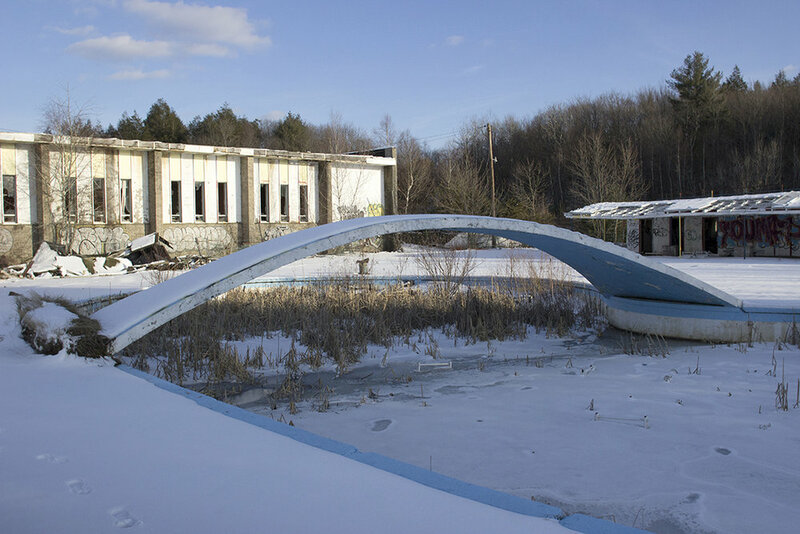 The once-popular resort had indoor and outdoor swimming pools, a golf course, ski slopes, an ice skating rink, a theater, a 400-room hotel, tennis courts and card rooms. Due in part to changing tastes and access to cheaper airfares, the resort business suffered and The Pines closed in 1998. The current owner, The Fallsburg Estates LLC filed for bankruptcy in 2002 and has done little to maintain the property. A lot of the buildings have collapsed roofs or have been reduced to piles of debris. The indoor pool is now an outdoor pool, the staff building burned in 2003 and the day care and staff quarters suffered a similar fate in 2007. The most distinctive attraction at The Pines (today, as well as in its heyday) is its kidney-shaped pool. It has a futuristic, swooping cement walkway over the middle and was filled with snow, ice and cattails when we visited. If you love before/afters, Pablo Maurer did a fantastic study of these abandoned resorts with side-by-side comparisons of postcards, matchbooks and archival photos. Because The Pines is so easily accessible, there isn't much stuff left inside of the buildings to hint at its former glory days. But the one thing The Pines has in spades is chairs. Of course, #theresalwaysachair, but the former dining hall is still filled with tables and piles and piles of chairs—so many that people have turned them into a de facto art installation by poking them into the walls and ceilings. The days of exploring these abandoned resorts seem to be coming to an end. Most of them are being actively redeveloped, and I would imagine that The Pines will one day crumble completely. I was surprised to discover that it had been built in the '30s—most of the buildings that we explored seemed stuck in the '70s. I have seen much older buildings in much better condition than the soggy, moldy piles that we found at The Pines, but if you look hard enough you can almost imagine a time when this was the place to be.